This is a wonderful and unique book. It's been endlessly fun, enlightening, and helpful at home. It empowers kids to put a voice to the struggles and trials of getting through the demands put on them each day. This book is full of tricks and hacks to make life smoother and easier. The coolest part is that it my son and I loved loved loved doing the activities. It has made a difference in our life in such a positive way. — From Patti H.
Dayna Abraham is a mom, teacher and writer, but before all that she was a misunderstood superkid herself. 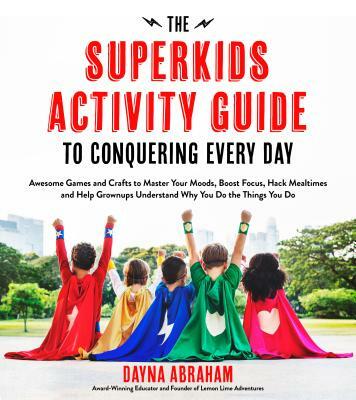 She’s written The Superkids Activity Guide to Conquering Every Day so superkids and parents can learn to understand each other and get along better. She is the founder of the website Lemon Lime Adventures, and she’s a co-author of STEAM Kids, Sensory Processing 101 and The Unoficcial Guide to Learning with LEGO®. Before she was a writer, she was an award-winning National Board Certified teacher. She lives outside Chicago, Illinois.